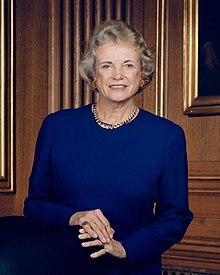 (1930- ) Sandra Day O’Connor was the first female Supreme Court justice and was appointed by former President Ronald Reagan in 1981. She completed her education at Stanford University and served in the Arizona courts before assuming her place in the nation’s highest judicial position. O’Connor battled and won her fight with breast cancer in 1994. She retired from the Supreme Court in 2006.